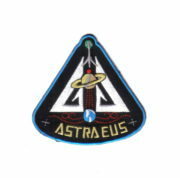 This is a reproduction of the Astraeus Project logo patch as seen on the hit sci-fi TV series Eureka. This was the planned space mission from the 4th season and is a mint, embroidered patch that measures 3.5″ high. 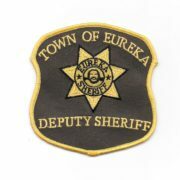 This is a reproduction of the Town of Eureka Deputy Sheriff’s shoulder patch as seen in the hit sci-fi TV series Eureka. 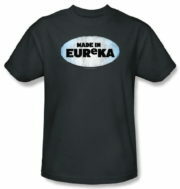 This is a 100% cotton, pre-shrunk, charcoal t-shirt featuring the Eureka logo in a white oval with the words “Made in Eureka” from the sci-fi TV series Eureka. This is a new, never worn t-shirt. This is a reproduction of the Town of Eureka Sheriff’s shoulder patch as seen in the hit sci-fi TV series Eureka. 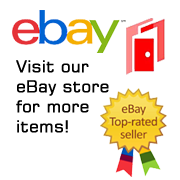 This mint, embroidered patch measures 4″ across. 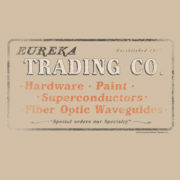 This is a 100% cotton, pre-shrunk, sand brown t-shirt featuring a spoof advertising sign from the early days of the town of Eureka “Special orders our Specialty” from the new sci-fi TV series Eureka. This is a new, never worn t-shirt.